On most Modern DLSR Cameras, when you press the Shutter Button half way down, the Auto Focus locks onto your subject. When you press the Shutter Button all the way down to take the shot, if you happen to move the camera slightly or decide to adjust your composition, there’s good chance that the camera will try to Auto Focus once more, but this time, not on your subject. This can cause many out of focus shots. A simple fix is to disable the Auto Focus Function from the Shutter Button and reassign it to a Back Button, aka Back Button Auto Focus or Back Button Focus. This highly recommended method works if the Sony Digital Camera is set to Continuous AF (C) on the Focus Mode Dial located on the bottom left front of the Sony Digital Camera. To Auto Focus now using the Back Button Auto Focus Button, press and hold the AF/MF button to activate Continuous Auto Focus. (The Shutter Button will no longer Auto Focus). If you take the finger off the AF/MF button, the focus will stay locked on the last focus point (so you can recompose the image). Press and hold the AF/MF again and Continuous Auto Focus will activate. This small technical change takes a little time to get used to, but you will get a lot more photos in focus. This feature also corrects the annoying issue of accidentally touching the AF/MF toggle button, which is under your right thumb, which used to switch the camera from Auto Focus into Manual Focus. The Auto Focus / Manual Focus Toggle Button has now been moved to the Center Button of the Joy Stick, so try and remember where this is. 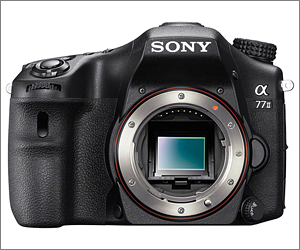 The Sony A77 II Camera has an Eye Auto Focus feature, which will automatically focus on an animal’s or a person’s eye. This is not to be confused with the Eye Auto Focus, where the camera focuses automatically, whenever you put your eye in the viewfinder. This is a great feature for portrait and wildlife photos of animals, but it’s not part of the Standard Focus Area Menu selection, making it difficult to figure out. You’ll need to assign the Eye AF function to a button. (The C Button for example). Point the camera at a the subject’s face. Press and hold the C Button while taking the shot. The Auto Focus will automatically lock onto the person’s or animal’s eye. If you want total control of your Camera’s Focus, there’s nothing better than the Old Fashion Manual Focus, especially when shooting Macro Photography. To make your Manual Focus easier to use, you should Enable Peaking Level and Peaking Color. When in Manual Focus, the Peaking Level highlights the exact Area in Focus. The Low setting recommended, because it’s more precise than using the Medium or High setting. Peaking is extremely handy in Macro Photograph, where your Depth of Field is often very shallow and you are normally shooting in Manual Focus, because using Auto Focus is all over the place. You have the options of using Yellow, Red or White for the Highlight Color, and Low, Medium or High for the Peaking Level. Meta recommends using the Low Level for more Precision Focus, and the Yellow Color because it’s easier to see (except when photographing yellow flowers). Meta typically shoots in Manual Mode, so she has full control of her Sony Digital Camera’s three exposure functions (Remember the Exposure Triangle). Meta sets her Front Dial to adjust the f/stop (Front for f/stop is easier to remember) and the Rear Dial to set her Shutter Speed (Typically set to 2.5x the lens size. Example: 50mm is set to 1/125th of a second for hand held). The ISO on the other hand isn’t as quick to adjust and requires pressing the ISO Button on the top, then moving the ISO up or down to get the correct exposure. This can sometimes cause an important action shot to be missed. If you remember the old film days, ISO or ASA, was fixed by the film’s speed, so adjusting the ISO wasn’t even possible back then. To make Manual Mode a bit easier to use, Meta often selects Auto ISO, which leaves her in full control of just the f/stop and shutter speed, using the front and rear dials, without having to worry about the ISO. Auto ISO is very handy for action or wildlife photography, or if the light suddenly changes, but you still want to maintain a constant shutter speed and aperture, or if you want to quickly bump up your shutter speed to say 1/4000th of a second, to capture fast moving wildlife. Give it a try! When shooting in Manual Mode, the Aperture and Shutter Speed are set to whatever you want to use (f/8 and 125th of a second are good starting points for outdoor use), so the ISO is set automatically for the given lighting conditions. You can still use the Exposure Compensation Button to make any fine adjustments to the light. Auto ISO is not a perfect solution, because in very low light, the Auto ISO can go too high (over ISO 800), and introduce some added noise. The lowest noise level will always be at the Sony Digital Camera’s native ISO of 100 (no sensor amplification). Website Photos Courtesy of Meta Gätschenberger, Award Winning North Carolina Nature Photographer. Meta Gätschenberger is an Award Winning Photographer from Blowing Rock, NC. Visit Meta’s Photo Gallery at Photos by Meta. Photos By Meta is a participant in the Amazon Services LLC Associates Program, an affiliate advertising program designed to provide a means for sites to earn advertising fees by advertising and linking to Amazon.com. Start Your Free 30 Day Trial of Amazon Prime! Photos By Meta – Boone NC Commercial Photographers. Photos By Meta – Blowing Rock NC Commercial Photographers. Photos By Meta – Banner Elk NC Commercial Photographers. Photos By Meta – Boone NC Website Photographers. Photos By Meta – Blowing Rock NC Website Photographers. Photos By Meta – Banner Elk NC Website Photographers. ©2019 Photos By Meta. All Rights Reserved. Boone NC Commercial Photographers | Boone NC Website Photographers.